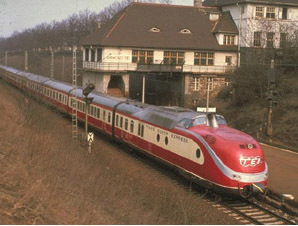 The DB built in the fifties for the international TEE (Trans Europ Express) express train network new diesel trainsets. Because there was very little time for construction there were no revolutionary developments used in the trainsets. A trainset consisted of the following parts: a motorunit, a compartment coach, a salon coach, a dining coach with bar and without kitchen, a dining coach with kitchen and restauration compartment, and another motorunit. The trainsets could be extended with several middle coaches until ten middle coaches. The trainsets were also suitable for the ferries to Denmark and Sweden. At the end of the sixties, the trainsets were renumbered to BR 601 within the framework of the European renumbering. In 1972, four motorunits were modified to gas propulsion and these got the indication BR 602. Without raising the weight, the speed of a ten part trainset (with one motorunit 601 and one motorunit 602) could be increased. At test runs a trainset consisting of two motorunits 602 and two middle coaches reached a speed of 200 km/h. A trainset consisted normally of the following units: D4ü+A4ü+A4y+AR4y+R4y+A4ü+D4ü, later very often the trainsets were extended with three middle coaches A4ü. To bring the comfort of travelling on a high level, the wide of the coaches was made as wide as possible. The coaches had a wide of 3012 mm, because that the coaches could only be 17,40 m long. All coaches were equiped with two bogies. Because the unusual shape of the motorunits they could be 19,20 m long. The chassis of the motorunits was made of welded steel. The sidewalls, roofs and bottoms were made of aluminium parts. The connections between the aluminium parts was mostly welded. A few panels were tied together with rivets to the side supporters. The sidewalls consisted of one part, to avoid welding joints. The coaches had all sideskirts. The chassis of the coaches were of light weight steel. The middel coaches had a self carrying construction. The coaches and motorunits were coupled with Scharfenberg couplers, which also carried the pneumatic and electrical wires. The connections between the coaches was of a new style, the so called "Gummiwulstübergang". The engine room in the motorunits was in the front, after the engine room was a room for the extra dieselengine and a cooling room. Between these rooms was the cabin, which was in a higher position which offered a very good view. The cabin was isolated and as a separate part elastically hung in the motorunit. In the back the motorunits had a luggage room with dubble swing doors and two compartments for train staff. The engines were accommodated in the two engine rooms in the front and in the back of the train, divided over the two motorunits. The transmission was accommodated under the motorunits and not in the powered bogies but in the bogies without power, because it was more reliable. The trainsets had a diesel hydraulic transmission. The diesel engines had each a capacity of 810 kW. The diesel engines drove via a coupling the hydraulic transmission. This was a transmission of type Voith, or a hydromechanical transmission of type Maybach. With the help of chainwheels the power was carried to both axles of a bogie. The electrical operated KE brakes were made as disc brakes. Besides each coach was equiped with induction brakes. Each motorunit had a diesel electrical generator of 210 kW which was responsible for the electricity of 380/220 volt in the train. Also the lighting, heating, airconditioning, kitchen appliances and air refreshment equipment were plugged in on this generator. The trainsets were equiped with Indusi and the security system of the SNCF for services across the border. The compartments in the compartment coaches were each 2,20 m wide and were equiped with 6 seats of each 700 mm wide. The saloncoaches had 33 seats, where 27 seats were turnable sleeping chairs. The trains were only first class. The kitchen coach was equiped with a kitchen, a buffet and a dining with 4 compartments with a seat arrangement of 1+2. In the second dining coach were also 4 compartments with a bar and an open space which also could be served as a dining compartment.